AFTER EIGHT YEARS of campaigning, homeowners affected by the use of concrete blocks with mica in their houses, were told earlier this month that a new scheme will repair the damage to their homes. It emerged a number of years ago that the mineral muscovite mica was present in the concrete blocks used to build a large number of properties in Donegal – and some in Mayo. Homeowners only discovered mica had been used when large cracks began to appear inside and outside their homes. The structural integrity of these properties can deteriorate very quickly and some have already been condemned, forcing the owners to move into rental accommodation while still paying off a mortgage on a house that is not safe to live in. This new scheme will assess the damage to affected properties and cover the necessary repairs. It was estimated by a government review of the scandal that as many as 4,800 dwellings in Donegal and 345 homes in Mayo may be affected. Eileen Doherty of the Mica Action Group described the recent news of the redress scheme as “amazing” and said she was grateful that the government had acknowledged the need for the scheme. But she said it has been a long time coming and the affected homeowners have endured many difficult years as they waited for the State to help them. 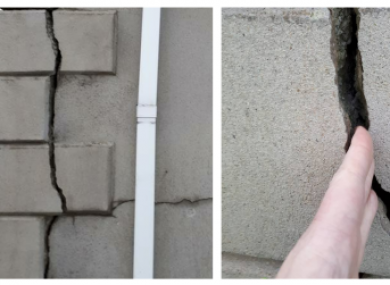 Her own home started showing signs of structural damage in 2012, with large cracks appearing in the walls. “Some people have been forced to move out of their homes over the last few years. We represent primarily private homeowners so they have to continue paying their mortgage and they have alternative accommodation to pay for as well. That’s a very difficult situation and that’s just the monetary stress, nevermind the emotional stress. A number of people have spoken to us about their relationships or marriages breaking down, or having to seek help for mental health issues – loads of people say that. Although some people moved out of their homes after advice from engineers, others simply could not afford to. We have a man whose property was condemned five years ago, a two storey house built on private family land, a lovely big house. It has these huge concrete supports between the top and ground floor which act as soundproofing. They’re a huge weight. The family have been living in there with these slabs, the weight of them on walls that are like Weetabix crumbling away. That’s above their heads every day and at any time it could collapse. They can’t keep a mirror on the wall, there are tiles falling off constantly, inside and outside it is totally and utterly ruined. They have no option but to stay in the house. Doherty said she believes many people may have been reluctant to speak out about structural issues in their homes because of the impact it will have on the value of their home. “The banks have mortgages on these homes and they have them on the books to be worth a certain amount that they were valued at when they were built. But every single time they are assessed and this problem is identified their value drops to zero,” she said. Doherty is hoping that the news of the scheme will encourage more affected homeowners to reach out for help now and she encouraged them to contact the Mica Action Group. “The scheme has been approved but we don’t have any detail so we will work closesly now with the department on the details,” she said. She said speed will be key in this scheme as “within 12 months a house can go from being repairable to having to be demolished”. Doherty also believes using more local contractors will keep costs down as it will cut out travel costs. “We want the money spent as sensibly as possible now. We don’t want to be costing the taxpayers money , but we as homeowners have paid for our homes and we’ve done nothing wrong. Through the lack of legislation we have found ourselves in a situation we have no control over and the only avenue is government redress. Minister Joe McHugh said earlier this month that work will start immediately on the design of the scheme. Email “'Totally and utterly ruined': The eight-year battle by homeowners affected by mica concrete block scandal”. Feedback on “'Totally and utterly ruined': The eight-year battle by homeowners affected by mica concrete block scandal”.